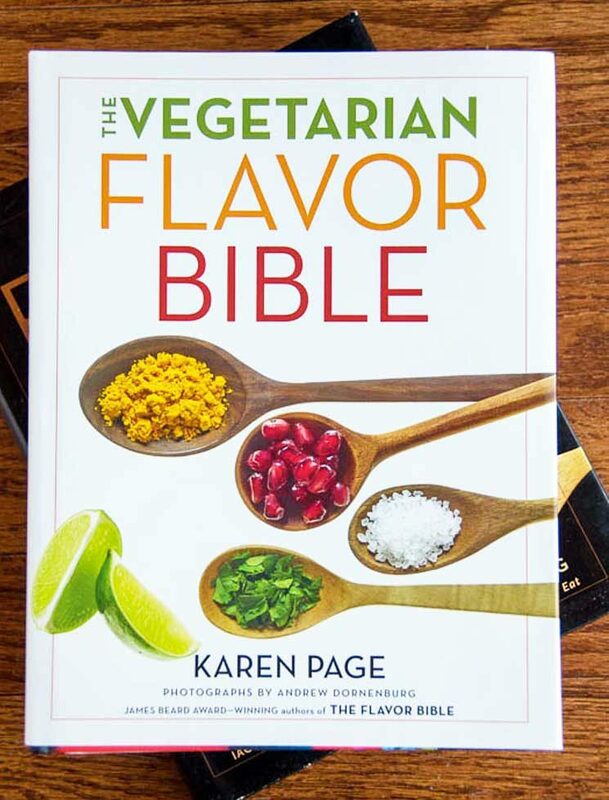 Up this week: The Vegetarian Flavor Bible by wife and husband team Karen Page and Andrew Dornenburg, who, according to NPR, have "written some of the most important books on food and cooking." They're certainly among the books I reach for most. This is a reference book you’ll use weekly, if not daily, in your kitchen. How often can you say that about a cookbook? Instead of recipes, it’s organized around ingredients (Cabbage, in General; Cabbage, Chinese; Cabbage, Green; Cabbage, Red; Cabbage, Savoy). For each entry, you’ll find a sophisticated but accessible list of complementary ingredients and flavors suggested by chefs, plus cooking techniques, sample dishes, and nuggets of chefly wisdom. This book will inspire you to create new dishes. It will confirm your hunch about adding — or not adding — that spice to that soup you’re throwing together. It will be your mentor and constant companion in the kitchen, and you won’t even have to take it out to lunch. For years the original Flavor Bible has been the first resource I reach for when developing recipes. When we stopped eating meat, I started using it as a de facto vegetarian flavor bible. When I learned that author Karen Page had spent a similar few years to mine — lost a dad to cancer, researched the connections between food and health, and even earned the eCornell certificate in Plant Based Nutrition — I emitted several involuntary giddy squeaks. Because she, of course, took those experiences a giant leap forward and turned them into a beautiful, empowering resource. The Vegetarian Flavor Bible is everything I’d hoped. It celebrates and respects plant-based ingredients and helps you make them fabulous. I’m tempted to say that wife and husband team Karen Page and Andrew Dornenburg need no introduction, but with seven billion people in the world, I should prolly say a few words in case you don’t know them. They are the much-lauded authors of nine books about food and the American food scene that together have sold almost a million copies and have won every major gastronomic book award, including Georges Duboeuf Wine Book of the Year, Gourmand World Cookbook Award: Best in the World, IACP Cookbook of the Year, and the James Beard Book Award for Best Writing on Food. Here’s the link at Amazon and Powell’s. It doesn’t really matter how you get this book. If you like to cook at all and enjoy plant-based foods, just do it. Tell ’em I sent ya. I have the book and love it. It’s a fantastic inspiration for when you don’t know what you want to cook. However, the first chapter about vegetarianism felt preachy and out of place for a reference book. It’s at least 70 pages that is probably mostly preaching to the choir. Still, that chapter aside, I LOVE this book.